Exactly 12 months earlier, Ratcat had completed their transition from indie faves to chart-conquering stars as their Tingles EP finally ascended to the number 1 position on the ARIA singles chart. This week in 1992, another band that'd started out on the independent scene debuted on the top 50 with an EP that'd go on to be one of the biggest hits of the year. But, like Ratcat, their period of chart dominance would be just as brief. Dominating the ARIA chart this week in 1992 was "Under The Bridge" by Red Hot Chili Peppers, which remained at number 1 for a third week. It had to happen eventually. 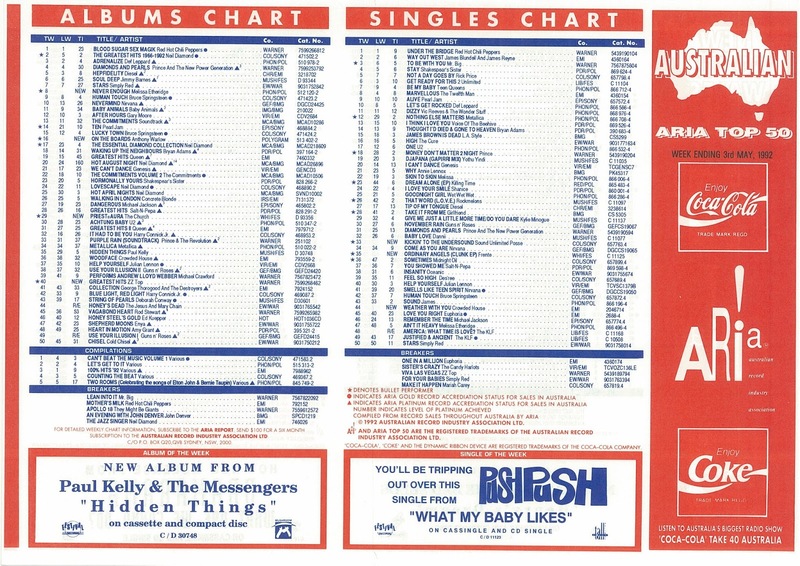 After releasing music since 1984, the acclaimed Australian rock band finally broke into the ARIA top 100 for the first time with this track from Henry's Dream. After the tongue-in-cheek "I Can't Dance" gave them the second biggest hit of their career, this bland MOR ballad was nowhere near as well received. Yes, the film it was taken from, Garbo, wasn't exactly a box office smash, but even so, I'm surprised this catchy single - which marked Mark Seymour's solo debut - wasn't bigger. I've no doubt mentioned before that despite the fact Simply Red had scored their two biggest hits up until this point - including their only Australian number 1 single - with ballads, I'd always been more partial to their funkier numbers. But just when Mick Hucknall and co. finally released a ballad I actually liked, it went and missed the top 50. It probably wasn't a coincidence that Stars was currently sitting at its peak position of number 7 on the albums chart, meaning this perfectly lovely third cut didn't come anywhere near matching consecutive number 29 hits "Something Got Me Started" and "Stars". Still it did better than the fourth and fifth singles from the album, "Thrill Me" and "Your Mirror", which both missed the top 100. Speaking of under-performing singles, Crowded House had had more than their fair share of them - some deserved, others not. And here was their latest. The fourth single from Woodface, "Weather With You" is one of the band's best known songs but it was just another mid-table hit on the ARIA chart - and didn't seem to spur on the album to much of a new sales growth, either. There was some good news - the sing-along-able tune finally gave the band their first big hit in the UK, where it reached number 7. Although he co-wrote the song and can be heard quite clearly singing on it, Tim Finn did not appear in the music video for "Weather With You", having already departed Crowded House by this point. Number 35 Clunk by Frente! Through a chart rules quirk to do with the number of tracks on extended plays, Frente! 's first, self-released EP, Whirled, debuted on the albums chart this week in 1992 (where it would peak at number 63). Meanwhile, their second EP - this time released through their deal with Mushroom Records' White Label - qualified for the singles chart and climbed into the top 50 on its way to a top 3 berth. It got there thanks to the quirky (or irritating, depending who you asked) "Ordinary Angels", which was one of the most unique songs out at the time. Short and sweet at two-and-a-half minutes long, the song showcased Angie Hart's lilting vocal style and, unlike their follow-up later in the year, stood firmly on the right side of cool. 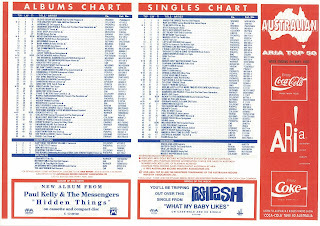 The original Australian video is below, while an alternate clip was made for the song's international release in 1993. Another local act occupying a unique niche was hip-hop collective Sound Unlimited Posse, who halved the chart peak reached by their previous single, "Unity". Obviously, much of the appeal of "Kickin' To The Undersound" came from its use of that troublesome flute riff from Men At Work's "Down Under". And although I understand why it was, as a result, much more commercially successful than its predecessor, I can't help finding the gimmick a bit cheap. Probably why I still listen to "Unity" but haven't heard this song in about 25 years. Next week: follow-ups to two of the biggest dance tracks of the previous few months. Plus, a music superstar enlists the vocals of a mystery woman for his latest hit. By my observation, the single of the week usually either became a flop, or was a single already in the top 50. If I remember correctly, both of those forthcoming Simply Red singles you mention were single of the week, as if to illustrate my point. 'Hold On My Heart' was bland... but pleasant enough. I never heard 'Hey Boys' at the time - well, that I was consciously aware of. I have since discovered via the 7two repeats that it got a few airings in the Summer Bay Diner. 'For Your Babies' might have done better if its title was in the lyrics (from memory it isn't); though what you could title the song instead, I don't know. It does seem odd that Crowded House couldn't score a single top 10 hit here between 'Better Be Home Soon' and 'Everything Is Good For You'. Though they saved the best 'til last from 'Woodface', with 'Four Seasons In One Day' being my favourite single from the album. Their most criminally-underrated single for me is 'Private Universe'. I liked 'Ordinary Angels' at first, and still think it's OK, but can easily see how it might grate on others. I generally liked their ‘darker’ singles like ‘No Time’ the best. Kylie wasn't the first to get la's confused with na's, as I remember a Smash Hits article making mention of the "na na na" chorus in 'Ordinary Angels'. While I could appreciate some of Sound Unlimited's other singles, I don't think I've heard a single song rapped in an Australian accent that I like. I think Sound Unlimited single did well because the CD single was so inexpensive. $2.99 from memory. I remember buying it not having heard the song because it was so cheap and thought "why not". Yeah, from memory, price reductions caused a few songs to chart higher than they normally would have in 1992 - didn't realise this was one of them. I got the "Kickin' To The Undersound" cassingle for $1.99. I had heard the song unlike Anon, but I also thought "Why not?" I think "Ordinary Angels" still holds up today. The whole first Frente album got a hammering on the Summer Bay Diner jukebox. They even played "Pretty Friend" in the episode 7Two aired today, which was from early 1996! I remember picking up the Candy Harlots Foreplay EP just because it was cheap. Another, somewhat surprisingly, was 'Alive' by Pearl Jam, which I seem to recall could be bought on CD single for $1 for a long period of time at what was then the Virgin Megastore in Bourke St. Somehow, I only bought 3 singles in 1992, but one of those was discounted - I think it was $0.99 (or may even have been $0.49) for Shakespears Sister's 'I Don't Care' cassingle; the CD single was $0.99. Another discounted release I remember seeing were Voice of the Beehive's 'Perfect Place'. I think Kim Wilde's 'Love Is Holy' was also discounted. A friend bought Deborah Blando's 'Innocence' for something like $0.99. I also remember VHS giveaways with Paula Abdul's 'Will You Marry Me' and Euphoria's 'One In a Million', and a 2-for-1 CD single pack with Rozalla's 'Faith' and 'Everybody's Free'. I also purchased "Kickin' to the Undersound" because it was $2.99 on CD single (I was also mildly obsessed with the track as a 12 year old), as well as Pearl Jam's "Alive" CD Single for $0.99, and Euphoria's "I Will Never Leave You" CD Single which was also $0.99. Good times! Hmm funny how cheap everything was discounted at the time. In recent times I was using spotify for 3 months which they promoted the $1 subscription. Then cancelled & now I use deezloader for both PC & spotify. It's free & sources all of it's music from deezer. Definitely worth giving a shot, all of the music is of the highest quality, 320 kbps. It matches spotify in every way, just throwing it in there to check it out.